It’s often hard to distinguish between Fox News commentator Sarah Palin and comedian Tina Fey. I try to distinguish because Fey is supposed to be funny and Palin is not. Palin is now seriously arguing that real Americans won’t have any truck with Democrats, or collaborate in any way in governing. She ripped Massachusetts Senator Scott Brown when asked on Fox Business network whether Brown should be on notice for siding with Democrats on the financial reform bill. She explained that real Americans wouldn’t stand for that, but Massachusetts was, perhaps, different. 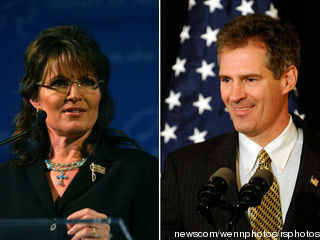 It’s difficult to decide whether Palin is unethical or just moronic. I don’t think she’s moronic—she couldn’t have gotten elected governor or made some sensible comments if she were a moron. Rather she’s a mixture of uninformed and hostile to the very idea of government actually governing. So I suppose that leaves unethical. The one thing I’m certain of is that John McCain was profoundly unethical when he picked such an unqualified running mate. This entry was posted on August 27, 2010 at 3:59 pm and is filed under Ethics-general, Government. You can follow any responses to this entry through the RSS 2.0 feed. You can leave a response, or trackback from your own site. Mrs. Palin speak with the voice of the American people. We can’t help it if Liberals don’t understand that language. She makes a mistake of this time though, or rather she contradicts herself. If the people of MA are that different from Americans and don’t want a Constitutional approach to governance, then Brown would be representing them by not being one. Good point. But you might consider that many of the legislators who voted for financial regulatory reform believe in Constitutional government. A lot of us do who don’t think Palin is the only Constitutional expert. I have some serious doubts about that, but those doubts are based upon the “reform” they actually voted for as opposed to regulatory reform in general. To a large extent the doubt is also based on the generally unconstitutional behavior of the current Congress and the POTUS as well. But please don’t take that to mean that I believe that the current GOP or many of their supporters are any better when it comes to governing within the limits of our constitution. I may agree with more of their goals, but I still loath some of the means by which they’re willing to achieve them. Can’t say I’d call this fair ethics commentary…partly because I’m not really sure what Palin thinks she’s saying, so I can’t call it unethical. I think the unethical thing is to make someone a commentator who is so annoyingly imprecise with the English language. That’s a Fox offense. Palin’s no moron, but she says a lot of dumb things (as would Tina Fey, I suspect, if her political commentary weren’t scripted). Whether she says dumber things than the current VP is a close call, and depends on one’s tolerance of like-minded souls. In the end, nominating someone with Palin’s qualifications for Vice-President was less irresponsible than nominating someone with Obama’s qualifications (as in “fewer”) for President…as the nation has discovered, to its sorrow. Ooooh, no. Obama got the nomination through his talents, and winning the nomination is a serious qualification. Palin had it given to her. But I don’t envision winning this argument.